On Jan 23 2014 we conducted the webinar on “Node.js development using Visual Studio”. This blog post will provide you some of the resources from the webinar like Slide Deck, Video recording of the webinar and source codes used in the demo. Every webinar we give away two .NET Ninja T-Shirts which have become quite popular among developers. In this webinar we have selected the following 2 persons to receive our t-shirt. Congratulations to the winners. We will contact you on the email address you have provided to us. We will ship the t-shirt to your address. On Jan 16 2014 we conducted the very first webinar of 2014 titled “Achieve Responsive Web Application with Ease using Kendo UI”. This blog post will provide you some of the resources from the webinar like Slide Deck, Video recording of the webinar and lastly the Q&A section. Responsive Web Design or RWD as it is known as, is an interesting topic in the landscape of modern day web application development. With the proliferation of mobile phones and tablets, your web page is seen not just in one screen i.e. Desktop Browser but also in Mobile Browsers and Tablet Browsers. Because of the screen size or form factor differences, it is important for your as a app developer to provide the right experience across the form factors. So in this webinar we looked at how Kendo UI is responsive and how you can build responsive screens using Kendo UI. Q: can we mix azure mobile services Apis with kendo? A: Absolutely. Kendo UI is a client side framework. You can use it with any backend. Q: can we integrate with Silverlight? A: Sorry, Silverlight is a very different framework. Kendo UI is a HTML 5 framework. Q: We have existing clients having content added in tables , can we make existing content responsive using CSS? A: Yes. Kendo Grid provides adaptive layouts as well. Q: Is Kendo UI necessary to develop responsive web design? A: No not necessary. It is a framework that enables writing web applications to deliver responsive design much easier. Q: What is the difference between Kendo UI and other similar services like Sencha? A: Kendo UI is an HTML 5 framework for the web, mobile and data visualizations. I am not as knowledgeable about Sencha but it could be just a mobile development framework. Q: Is it necessary to use visual studio or we can use other IDE also? Q: Required to import Kendo UI framework/library in projects? A: yes. that’s what gives the functionality of being responsive. Q: Does Kendo do any polyfill ? A: Yes. We do polyfilling under the hood. We sniff the browser and see if it supports HTML5. If not we polyfill. This is pertaining only Kendo UI controls and behaviors only. Q: When we design a responsive web design application, is it like we wont see horizontal scroll bar? A: Horizontal scroll bars are not considered good usability. 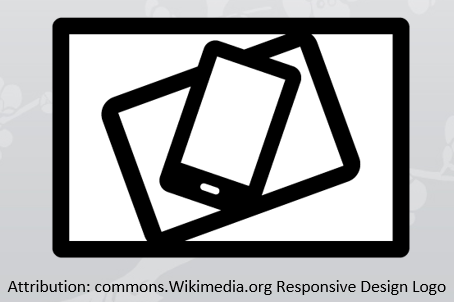 So, responsive design avoid having them. Q: For Kendo UI .net framework required? A: No. Kendo UI doesn’t require .NET framework. Q: Can Kendo UI be used with android as well? A: Kendo UI Mobile controls can be used to create cross platform hybrid mobile applications. Q: How does the old browsers behave with Media queries? A: While some polyfill is available, Kendo does require modern browsers with HTML5 support to function correctly. We support IE7+, FF, Chrome and other major browsers. Q: Does all the controls in Kendo are responsive in nature, or not? A: Yes, they are. And then there are adaptive layouts for Grid etc. Q: How will be the performance of Kendo UI control? A: We have optimized Kendo UI for extremely fast performance. In our studies it may be perform a lot better than some other frameworks. 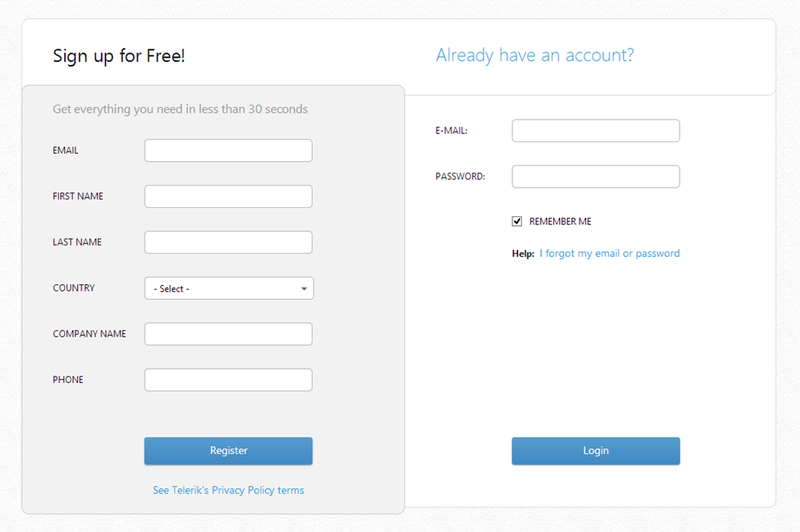 Q: Is Kendo UI based on twitter bootstrap? A: No. We have out of the box 11 themes that we ship. We have also released a Kendo UI Twitter Bootstrap theme and with this theme all our widgets will look and feel like a bootstrap scheme. Q: Is it light weight? Q: Is it mandatory to know HTML5 in order to use Kendo UI? A: yes, Kendo UI is based on HTML 5 capabilities. Q: Is it compatible with Windows phone too? A: Kendo UI Web controls are supported on latest and greatest browsers which support HTML5. We also have Kendo UI Mobile controls which can be used to develop cross platform hybrid mobile apps. Kendo UI Mobile are supported on all major Mobile OS. Q: Is there any difference between ASP.NET MVC Kedo UI controls and simple Kendo UI controls? A: The functionality is the same in both. The programming model is different. Kendo UI needs JS programming while MVC controls are programmed with Razor syntax. Q: Can we use Kendo UI with Asp.Net MVC 4? A: Yes. We support MVC 3+. Q: Kendo UI is browser specific? A: Nope. Just requires a HTML 5 enabled browser. Q: I’m using fusionchart component for data visualization.. i want to make it responsive as my app works on iPad and desktop.. is it possible with Kendo? Q: can we integrate with PHP site? Q: Can we use Kendo UI in xcode? A: Kendo UI is a web framework. You would be building native app with XCOde. In that case, you can use Kendo in a WebView only. Q: How can we customize Kendo Ui to adapt style sheet css from our web application, Requirement is Kendo ui controls use the web site theme ? Q: can we create custom controls using Keno UI? A: Yes. We support plugin architecture. So you can create a custom plugin and use it as a Kendo UI Widget. Q: Is all Kendo UI controls are responsive? Q: Can Kendo UI be used with PhoneGap? A: You will need to develop a server side application that spits out REST based JSON data. In .NET, you can use WebAPI or WCF Data Services. Q: Can we use Kendo UI in java? Q: is there any drag and drop control in Kendo UI? In this blog post I will be exploring how to get started with our Kendo UI Grid Wrapper for ASP.NET MVC. 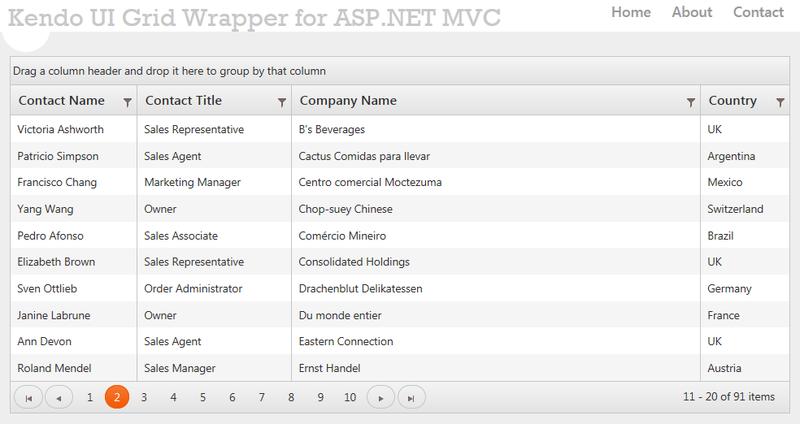 We will take a basic usage of displaying data in a grid format in an ASP.NET MVC view. To know more about Kendo UI Web controls head over to www.kendoui.com. If you want to follow along with this blog post, you can do so by downloading a 30 day free trial of Kendo UI Complete for ASP.NET MVC. First lets create a ASP.NET MVC project. I am using Visual Studio 2012. When you install Kendo UI, we also install certain project templates which make it easy to create kendo UI based ASP.NET MVC project. I assuming you have installed Kendo UI Web for the rest of the post. In Visual Studio, select File > New Project > Web > Kendo UI for ASP.NET MVC. Give it a name and wait for Visual Studio to spin up the new project. Well that’s all it takes to create a grid in MVC. Now lets go over the code in detail. now when you run the project and perform any operations, grid will not send a request to the server but do it client side. This blog post was like a primer to anybody who would like to get started with Kendo UI Grid Wrapper for ASP.NET MVC. With just 15 lines of settings you will have a full fledged grid in your app within no time. If you are interested in Kendo UI Grid, do download a 30 day free trial at www.kendoui.com. A Very Happy New Year to you! 2014 is expected to be a good year for IT industry that is still recovering from the slow down in 2013. Forrester is forecasting good IT growth in 2014 with focus on mobile, cloud and analytics. What this means for development teams is the need for new skills to cater to the hungry business users. I called the business users “hungry” for a specific reason. The business users are now demanding consumer grade experiences on multiple devices as they have become accustomed to the great user experience they offer. 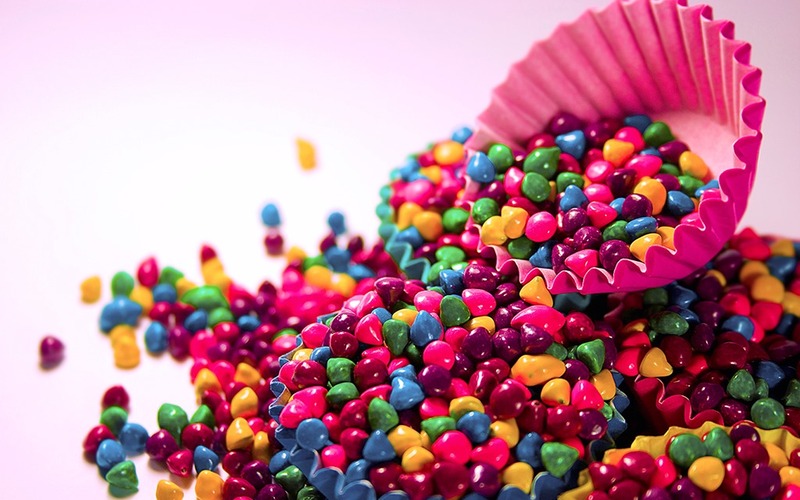 This hunger will need to be satiated by the development teams of today. Telerik is ready to help you take on these new challenges with new products and services in the new year. In addition, we are happy to share our learnings with you so that you can deliver the experiences that your customers want. Register for free by clicking on the webinars, you would like to attend. We will remind you of the upcoming webinar a day prior to the event. By popular demand, we will continue to give out Telerik Ninja T-Shirts to the top 2 engaged attendees during the webinar. Now, aren’t the celebrations continuing after the New Year?